Michael Phillips Reviews Disney's Animated Feature Movie "Bolt"
Like so many Disney animated features across decades of nightmare-addled preteen moviegoing, "Bolt" is consumed with abandonment issues. I felt abandoned just watching it. It's a seriously withholding action comedy, stingy on the wit, charm, jokes, narrative satisfactions and animals with personalities sharp enough for the big screen, either in 2-D or 3-D. I saw it in 3-D, which helped, especially with an early, massively destructive chase through the streets and freeways of Los Angeles. Plus, the herky-jerky movements in the head and neck region of three credulous pigeons -- those were funny. But the story! A mess. And the pathos! Stop! I give, I give! Voiced by John Travolta, the chief asset in a bland ensemble struggling with its material, Bolt is a fuzzy American white shepherd, the headliner of his own TV show co-starring his longtime owner, Penny, voiced by Miley Cyrus. Bolt has never been informed by Penny or his greasy handlers that his life-or-death adventures are fake, so when the cameras (which he never sees) stop rolling, he maintains constant vigilance, on the lookout for the show's nemesis (Malcolm McDowell). This dog never relaxes. He's always tense. He's the star of his own depressing version of "The Truman Show." Screenplay complications of no particular distinction separate Bolt from Penny, sending him to New York City in a parcel stuffed with Styrofoam. There he confronts the perils of a new environment, where his "super-bark" and "Six Million Dollar Dog"-type powers, which he believes to be real, are useless. This brings us to the question of realism. "Bolt," directed by Chris Williams and Byron Howard, depicts urban landscapes of photorealistic detail, then plops cartoon critters and "Wall-E"-inspired puffy human beings in front of those landscapes. What good is the realism? It's no fun to see Bolt ram his head into a fence or a metal crate, over and over. The story is a protracted exercise in canine frustration. When the perpetually nerve-racked dog hero dangles his frenemy, the cat Mittens (voiced by Susie Essman), over a busy freeway, the bit is neither amusing nor the right kind of suspense. 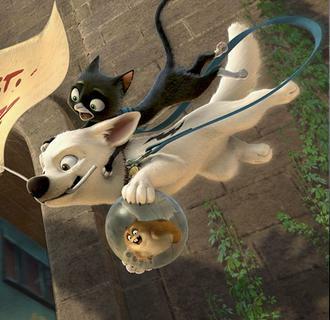 Most of "Bolt" is taken up with dog and cat making their way across the country to find Penny back in L.A., with their newfound third musketeer, the hamster Rhino (Mark Walton, who sounds a lot like Patton Oswalt's Remy from the infinitely richer "Ratatouille"). The movie offers a series of wan Hollywood in-jokes involving "Finding Nemo" and focus groups and such, en route to the moral that Hollywood is an evil, shallow place and the heartland is where it's at. Well, of course it is. But Disney can do far better than this, even in the budget-conscious range. MPAA rating: PG (for some mild action and peril). Starring the voices of: John Travolta (Bolt); Miley Cyrus (Penny); Susie Essman (Mittens); Mark Walton (Rhino); Malcolm McDowell (Dr. Calico); James Lipton (The Director); Greg Germann (The Agent). Directed by Chris Williams and Byron Howard; written by Dan Fogelman and Williams; additional material by Byron Howard and Jared Stern; art direction by Paul Felix; look and lighting direction by Adolph Lusinsky; edited by Tim Mertens; music by John Powell; animation supervised by Doug Bennett; produced by Clark Spencer. A Walt Disney Pictures release.